The following project management strategy will help you plan, start and complete basically any project – no matter the subject or your grade level. Not a student? It can even help you organize and get through work or home projects. Before I go any further: You can download and print my SchoolHabits project manager template here (free) to help you get started using the strategy I’m about to teach you. No matter how big your project or assignment, it can be reduced into a series of 15 minute tasks. You can break down every single long-term or large-scale assignment into a bunch of tasks that each take 15 minutes or less. That’s the trick. That’s how productive people actually get things done. That’s the golden nugget. You could seriously build an empire (or just get your history project done in time) by doing one 15-minute task after another. When we are able to break down huge and complicated projects into nothing more than a series of 15-minute tasks, we begin to see them as doable. We are no longer paralyzed by the idea of one giant thing we must do. We think, Only 15 minutes? Yeah, I got that. Use my free SchoolHabits project manager to plan your project. Begin by breaking down your project into no more than 4 main parts. These steps should be general and sequential. Break each of the 4 parts into a series of 15-minute tasks. If you think a task is going to take more than 15 minutes, then break it down more. Once you’ve completed the first task, do the next one, and the next one, and the next one … until you’re done. If you get stuck anywhere — for example, if you have a question or some part of the project/assignment is unclear — try to get an answer right away: email the teacher, ask a friend, Google it, whatever. And in the meantime, see if you can move on to the next 15-minute task so you don’t lose momentum. 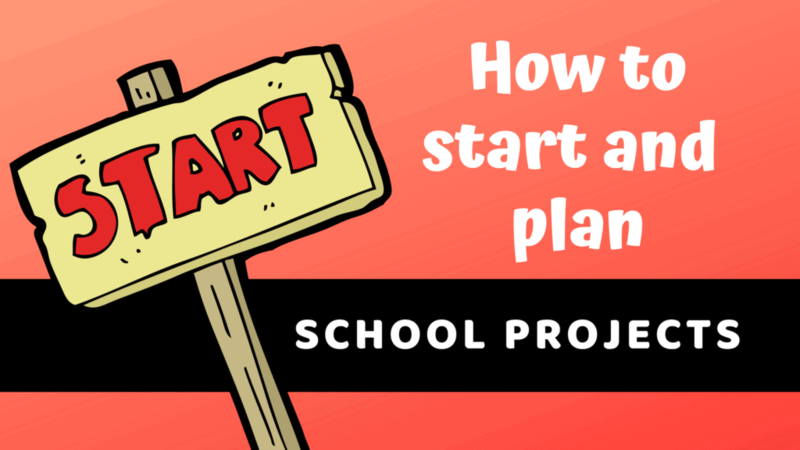 Ready to try this strategy for how to start a project for school? If you’re on the fence, I challenge you to actually give it a shot the next time you need to do any assignment that might take you more than two hours to complete. I have taught this time-management strategy to thousands of students and the payoff is incredible. Don’t forget – here’s my project management template – SchoolHabits project manager – to get you started.